The Eastern Mountain Products Artica Backcountry Snowshoe didn't come here to mess around. Snowshoe runners rejoice...the Atlas Run snowshoe features the totally new LightSpeed Binding for precise foot placement, while shaving crucial weight. The Spring-Loaded(TM) Suspension flexes the new, ultra-light Speed V-Frame for powerful energy return, natural articulation, and an uncompromised running stride. The Run's lightweight aluminum Twin-Trac(TM) crampons offer traction on icy hillsides. The FLEX NRG is the gold standard for ergonomic comfort. The patented Soft Strike zone, which acts like the shock-absorbing midsole in your athletic shoes to absorb shock and reduce footslap noise, coupled with the biomechanically-designed FLEX Tail makes the FLEX NRG a dream for your joints. With the set-and-forget 180FLEX binding, and the FLEX Series 3D-curved Traction rails, the FLEX NRG is designed to keep you secure for your all-day treks. A kid-sized version of MSR's strong, reliable Denali snowshoes, these easy-to-use snowshoes are intended for children who weigh up to 90 pounds (41 kg). 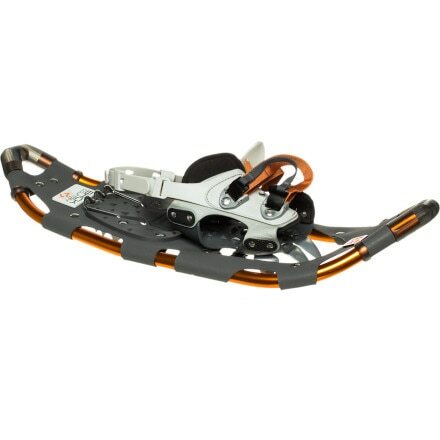 They feature steel crampons and kid-friendly molded traction bars for great all-around traction and added safety. The Lightning Modular Flotation Tails bring the advantage of MSR's proprietary, adaptable flotation to their elite 360 Traction frames. Small and light enough to bring on any trip, you can take advantage of the agility of a smaller, primary snowshoe in packed conditions, while adding 5-inches (13cm) of flotation on-demand for deeper snow, or when carrying heavier packs. MSR Lightning Flotation Tail, 5 in. Easy-to-attach flotation tail adds 5 inches to MSR's 2011 Lightning snowshoes, providing extra flotation in deep snow or when carrying a heavy pack. This kit offers complete and easy field maintainability of all MSR snowshoe binding pivot points and rivets. The Crescent Moon Snowshoe Booties enable you to use your favorite trail shoes in wet and cold conditions.